The Double Core pillow is a unique foam pillow that allows you to choose the level of neck and back support most comfortable for you. 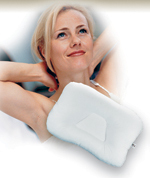 The second core is the secret to this neck support pillow's versatility. The 4 in. lobes offer two different levels of support. This foam pillow measures 22 in x 16 in and comes in two firmness levels, medium/firm and firm/extra-firm. Washable, cotton/poly cover included. Fits a standard pillowcase.